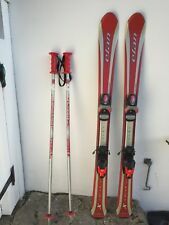 Ladies Elan All mountain Skis 152cm. Condition is Used but skis have just been serviced so in excellent condition, particularly the bases. Lovely graphics that include sparkles on the skis and the bindings. 152cm length. 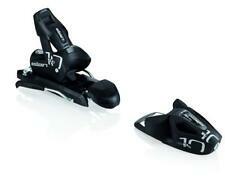 Elan Elu9 Fusion bindings. All working well. Have been recently edged, waxed and serviced. Some scratches on the tops of the skis due to the lift queues etc! A great pair of all round skis. Collection from Rochford. Delivery can arranged within the Southend area. This is for a pair of short skis. I am not sure if they are a short adult ski or for a child ?. They say they are Parabolic Racing Syruflex. Slalom skis in a good used condition, edges have lots of life left in them. EP11X by Vist. Elan Ski Bindings Complete with Plate. Complete with Fixing Screws. Din Setting 3-11. Amazing kids red Elan skis and Cober poles. In great condition and have been well looked after. A few marks and dents but great for kids of all abilities. Full length of skis - 43” Full length of poles - 36” Used on my kids when they were about 6-11 years old but please check sizing. The skis come with adjustable bindings so can be moved as their feet grow! Haven’t been used in about 6-7 years but used for about 12 years before that and waxed and serviced every year for those 12 years. Cool red/silver design. I also have red kids helmet and goggles lsited. Kids GS skis in a good used condition, edges have lots of life left in them. Elan TBT 190cm All Mountain Skis. Condition is Used. Very good all mountain and powder skis, with base technology reducing the risk of catching an edge. ELAN Parabolic skis. Whistler. Salamon binding. Salamon binding. Parabolic skis. Made by Elan. At least 24-48 hours notice needed before collection. Great 151cm Elan Snowboard. A good all mountain snowboard. It's in good condition but has been used so has some scrapes. Nothing major and the base is unblemished. I've kept it serviced and well looked after. Collection only from Lordswood, Chatham. LENGTH/RADIUS 105cm / 6.8. We are able to fit the bindings for you upon request at no extra fee. Early Rise Rocker. Full PowerCap, Synflex. Elan skis .188 Cms. Traditional Alpine Skis . Used Once Only . Elan skis .188 Cms. Traditional Alpine Skis . Used Once Only as wrong size purchased ! Have been stored in the loft for the past 15 years So need new bindings as plastic release parts have broken . Actual skis are on very good condition. Ones with storage bag. Local collection only . BINDINGS Elan EL10. The skis can be collected in person in Abertillery, NP13 (Wales). We do not have a showroom for the skis, but we can arrange a viewing for any specific models you might be interested in. Skis. Condition is Used. Collection in person only. Part Code: AB8.051/108. L 160 / 110.69.96 / R 14.4 – Mojo Bindings. These have Mojo bindings fitted I am was a size 9 so this is guideline of the binding size. 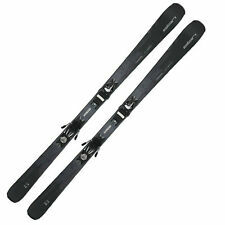 They have been great ski's I have done blacks in these too, nut i needed more advanced skis the past 2 years. (Grimsby DN32-9AS). 151cm (59"). 'Parabolic SCX' Skis & Bindings. Fitted with Rossignol bindings. Includes carry bag. ELAN EL9 BINDINGS. LENGTH 165cm. ELAN RACE SLR. These skis have been seldom used but are about 15 to 20 years old. SKIS CARVING ELAN EXAR 160 cm !!! BINDINGS ELAN EL10. Skis condition as the pictures. ALL SKIS ARE SENDING FROM AUSTRIA OR POLAND. Adjustable front and rear, for all size (260-380 mm). base are in very good condition, ready for the season. They're in very good condition. There is a little wear alongs the edges, but nothing serious. The bottoms of the skis are in really good shape. They don't like they've been used much. Good quality skis here. For sale, pair of superb Elan Ripsticks with Marker Griffin bindings. Sadly just a bit too long for me so have brought the same ski in a shorter pair. Bases are in absolute mint condition, usual few scuff marks on top sheets. Pick up preferred, Clacton on Sea, Essex but can post for £25. 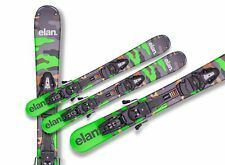 Elan Freeline 125 CM Short Skis 2018/19. The Elan adult short skis are a serious tool for most skiers looking to learn to ski or improve there sking. Tip-to-tail wood core, Rugged “snakeskin” top sheet for high durability against scratches. Elan Wave Strider Splitboard 158 & Kohla Skins. Elan Perla 7.5 Ladies Bindings. The Elan Perla 7.5 Bindings are a lightweight binding that are perfect for older junior. skiers and smaller adults. They have a 72mm brake so these will only work on narrower skis. SKIS ELAN AMPHIBIO 13 TITANIUM 176 cm !!! TOP SKIS 2017/18 ! 1x Pair of Elan Racer Skis 1x Pair of Blizzard Turbo Pro Skis Selling both pairs for £18 Both pairs come with the bindings, but only have one pole left. Collection only. SKIS ELAN RACE GSX AMPHIBIO 182 cm !!! TOP SKIS ! SKIS CARVING ELAN RACE GSX AMPHIBIO 182 cm. BINDINGS ELAN ELX12 FUSION. Skis are in very good condition as the pictures. ALL SKIS ARE SENDING FROM AUSTRIA OR POLAND. POWER SPINE TECHNOLOGY, DUAL TITANIUM ! Early Rise Rocker. Quick Trick. WaveLight, HSS Sidewall, Dualite Woodcore. BINDINGS : Elan- adjustable to all sizes of ski boots.Bindings mounted on rail. Overall skis are in good/very good condition. It will spring, pop, butter and slide anything in its path while making great turns on the way there. We are here to serve you as the best way possible. We are here to find the best way to solve them! AMPHIBIO 76. Equipped with elan's unique Amphibio construction, which two ski constructions (camber and rocker) in a combined. Amphibio technology. EL 10.0 QT binding. Binding: EL 10.0 QT (Z 3-10). Marke Elan. If you want a park ski that has lots of pop to it that likes being in the air more than being on the snow, the Elan Sling Shot is a perfect ski for you. BINDINGS : Elan -adjustable to all sizes of ski boots.Bindings mounted on rail. The Amphibio 12 Ti is the perfect ALLROUNDER for the weekend. Amphibio 4 d the 4 d's patented Amphibio technology is the latest evolution of the modern ski construction. Combined with the Amphibio profile, this ensures unmatched all-mountain versatility and maximum performance. Elan Alpine Ski Bindings ELS 11.0 Shift. Marke Elan. Color: black, matt. Skiboard ski touring snowboard Splitboard Elan Strider Voilè Compatible Split Kit. We are here to serve you as the best way possible. We are here to find the best way to solve them! The ELAN SNow is the ideal ski for all beginners who want to learn to ski quickly. It has an optimum adhesion and stability. Marke Elan. EL 7.5 SHIFT binding. Perfect combination between comfort and stability - ideal for BB´s practice and beginners! Skiing is about having fun, that's why you should get your kid Elan's Twist Skis. Not only are they light but more importantly they make learning to ski easy. What sets them apart from your standard children's ski, is their use of U-Flex technology. Varying densities of material along the length of the ski gives optimal flex distribution, allowing even the lightest of skiers to flex the ski. Helping to build a solid foundation for your child to master their skills. The skis come equipped with Elan's Quickshift binding, that easily adjust to growing kids feet. Whether this is their first season or they've only experienced rental skis, the Twist is affordable and makes learning to ski fun!.